Fleas are very difficult to catch due to their ability to jump. A common name for fleas is sand fleas. What causes a flea outbreak? Fleas generally become a problem when their preferred food source is not available. Flea outbreaks can occur after a pet’s death or when people move into premises where a dog or cat previously lived. This is because fleas in the early stages of development can stay in carpets or undisturbed edges of floors for up to 1 year. Once the house is reoccupied, the fleas then develop into adults. What are the health impacts of fleas? In Australia, fleas are not known to transmit any human diseases, although this does occur in other parts of the world. Skin reactions to flea bites can appear within minutes or may be delayed over hours and even days. Family members can react differently to flea bites. People who are allergic to flea bites can develop lesions, itching or other symptoms. 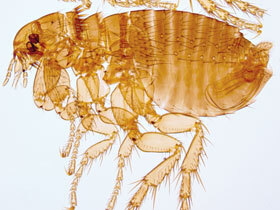 How do I manage a flea outbreak? Fleas can be readily controlled provided you follow a few simple steps. If you have a pet, seek advice from your vet as to the most appropriate product to kill fleas. To completely manage the outbreak it is important to treat your pet, its bedding, and your house at the same time. Your efforts will be wasted if you only focus on 1 or 2 areas where fleas may live. Remember that your carpet may contain fleas in all stages of their development, not just live adult fleas. Steam cleaning your carpet will kill many adult and pre-adult fleas but some eggs may survive and hatch afterwards. It is also a good idea to check with the carpet cleaning company that your carpet is suitable for steam cleaning. Even if you don’t steam clean your carpet, you should vacuum carpets, floors and upholstered furniture such as couches every day for at least a week. Pay particular attention to areas behind doors, furniture and cupboards that are often undisturbed. Before disposing of the contents of the vacuum cleaner dust bag, it should be treated with an insecticide or placed in the freezer for 24 hours to kill developing fleas. If you still have fleas you may need to use a pesticide. Fleas are very persistent and you may need more than 1 pesticide treatment for a severe outbreak. There are many pesticides registered for flea control. Select the lowest strength pesticide product that will do the job. If you wish to treat your house yourself, use a space spray (flea bomb) or surface spray that contains both a pyrethroid pesticide and an insect growth regulator. Treat areas where pets sleep with a suitable pesticide spray. You may need to do this weekly until the flea outbreak is under control. Repeat the spray in another 10 to 14 days. The initial spray will kill adult fleas while the second spray will kill developing fleas that survived the first application. When using any pesticide read and follow all directions on the label. Remove food or place in airtight containers. Remove or cover crockery and kitchen utensils and wash them prior to their next use. Do not allow anyone else in the area when using pesticides. Remove pets. Take care when applying insecticides to carpeted areas particularly where crawling babies may be present. Toys can also become contaminated in these situations. The use of steam to kill adult fleas and their larva where babies may come in contact with insecticides is preferred. Ensure that your house is thoroughly aired after using pesticide products. Flea outbreaks can occur after a pet’s death. Skin reactions to flea bites can appear within minutes.